Forrest performed on Show 311, recorded in Atlanta, GA, on September 19, 2015, at age 15. Forrest Eimold, 15, organ, is from Winthrop, Massachusetts, and attends the Roxbury Latin School. Forrest currently studies with Marc Ryser at the New England Conservatory Preparatory School, and attended the Greenwood Music Camp in 2014. He is the current organ scholar at St. Paul’s Parish in Harvard Square. He participates in a self-coached piano quartet called “The Borealis Ensemble” and is also in a violin duo. 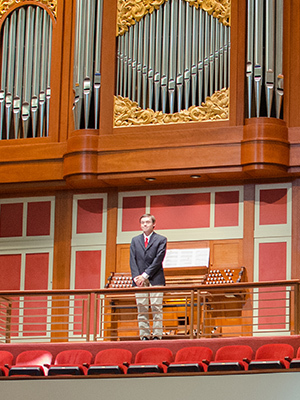 Forrest is also a composer, and was named a finalist in the ASCAP Morton Gould Young Composers Competition. Outside of music, Forrest enjoys reading, as well as watching movies.